Irish research continues to get easier with more and more resources becoming available online. 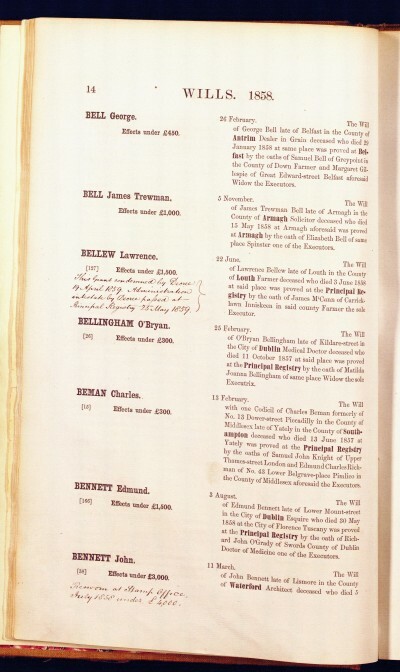 “The National Archives of Ireland has been busy updating its online catalogue with an entry for each of the Calendars of grants of probate of wills and letters of administration from 1858-1982. All calendars from 1923 to 1982 have been scanned and links are available here on the Council of Genealogical Organisations page. Chris Paton of British GENES (British Genealogy News and Events) notes that the equivalent probate calendars for the counties of Northern Ireland, both before and after partition, from 1858-1943 are also available in database format at www.proni.gov.uk/index/search_the_archives/will_calendars.htm.